As unique as the annual Daytona 200 on the Daytona International Speedway is Daytona Race. After Rise & Shine from the album of the same name, it is the second EP release from DJane Miss Luna's debut. She rocks the track with lush beats and solos from the Iberian guitarist Eugenio Cañavate  for the perfect atmosphere to both enjoy and party, from the relaxed sundown into the sizzling nightlife. The combination of extremely cool House beats and the energy-loaded guitars make this track a real hit. 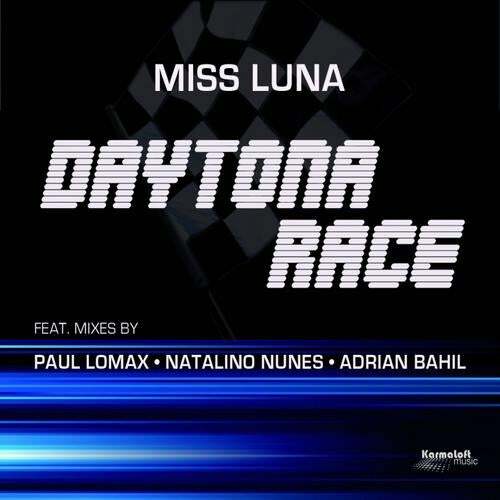 In addition to the melodic Tech-House Radio Mix four more inspired remixes take up the basic idea of the track and give Daytona Race their very own flavour. So it is Paul Lomax who delivers a flawless club track. Not just since his resident DJ jobs in clubs like Space or Amnesia on Ibiza is he one of the most frequently booked DJs in the world. He made his name with remixes and productions. And his mix of Daytona Race will surely resound more than once in the premiere clubs. Adrian Bahil (produced, amongst others, for Tom Novy and DJ Tomcraft), utilises deep, smooth basses to create a club atmosphere, which leads you dancing right into the sunrise  with Tribal and Afro elements and driving percussions. His vision of the track will surely not just captivate his own fans. It is a true highlight on this single. The Parisian-by-choice Natalino Nunes refines Daytona Race with his very special mix of Tribal, Techno and Electro, combined with African elements. His remix has its very own esprit and is the perfect beginning to a night of partying. Cool and sometimes funky is the Bés & Meret remix. And it is very pure: deep, pulsing beats and the unique guitar. It is a mix that gives you chills and that is the perfect soundtrack for the sunrise as well as the sundown.